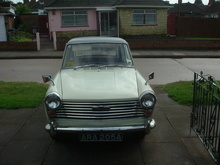 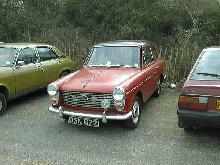 Launched alongside its larger engined sister the new A40 Cambridge made its debut in 1954. 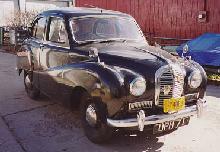 The A40 Cambridge replaced the separate chassis A40 Somerset, which had been based on the 1947 A40 Devon, this new A40 model made good use of modern monocoque chassis technology. 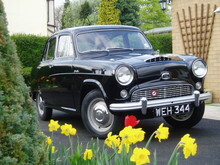 The new car was originally going to be available in both two and four door saloon versions, however the two door cars never made it into serious production. 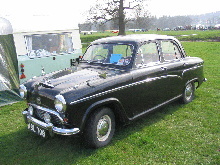 The A40's styling was very modern for 1954 and featured an overall square body design, complete with a full width grille that did not resemble the old traditional Austin design, although the old "flying A" mascot still adorned the bonnet. 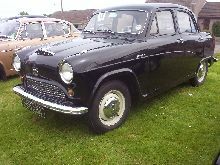 The 1200cc A40 Cambridge failed to sell in large quantities, mainly because it seemed under-powered compared to its 1489cc, A50 sister car. 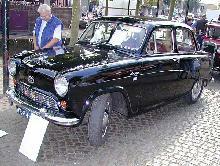 Production ended in 1957 after only 30,000 cars had been produced.